Azores Airlines hopes to do with the Azores – Portugal’s nine volcanic islands in the North Atlantic Ocean – the same as Icelandair has done with Iceland. 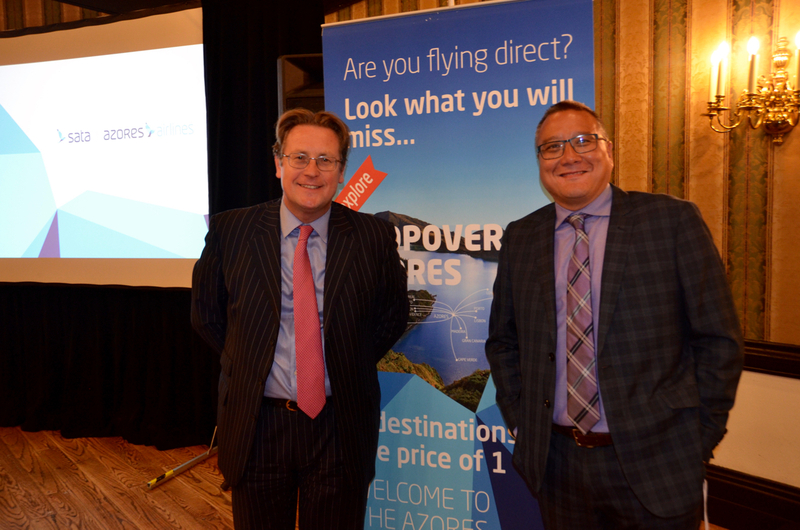 With a hub in Ponta Delgada, Gavin Eccles, chief commercial officer, Azores Airlines plans to position a stopover in the archipelago as a way for travellers to experience two unique destinations for the price of one. Operating five weekly flights from YYZ this summer, he says the airline connects passengers onwards to Porto, Lisbon, Madeira, London, Frankfurt, Cape Verde, and Gran Canaria. Describing it as Portugal’s oldest newest airline, he says agents drive 40% of the business for Azores Airlines, which boasts a 6% commission rate. This summer will see four weekly flights to PDL and one to TER from YYZ, as well as weekly service from YUL to PDL. Some selling points for the airline are that baggage, pre-seat selection and food and beverages are included in the ticket price. Pictured at the event are (l-r) Eccles and William Delgado, Visit Portugal’s country manager for Canada.